The Entrepreneurial Journey is a Roller Coaster. Put Your Life First. “The entrepreneurial journey is a roller coaster,” they’ll tell you. “But the rewards are worth it.” I’ve heard this, or some derivative of it, more times than I can count. Some entrepreneurs really believe it while others just mouth the words. I’ve gone on the entrepreneurial journey myself a few times, so I know the story. But there’s an unstated subtext to these conversations. What entrepreneurs normally don’t tell you are the physical, social, emotional, and spiritual impacts of riding their roller coaster. They don’t tell you about their chronic back pain, their sky-high blood pressure, or the 35 pounds they’ve put on since starting their company. They don’t tell you their marriage is falling apart or that they missed all but half of one of their kids’ swim meets. They don’t mention they’re on Paxil and can’t sleep without half a Xanax. And they definitely don’t tell you they feel spiritually dead; they don’t realize where that all-enveloping sense of weariness comes from. When you’re on-call 24/7 for years at a time there is never any true silence. Spirituality occurs in silence, and many of them haven’t even noticed it’s missing. The company in this example has grown by a factor of 8.5x in four years. Its results and trend line are clearly positive. But check out the amount of time this business is sitting below the trend line! It’s at least 50%, maybe a bit more. 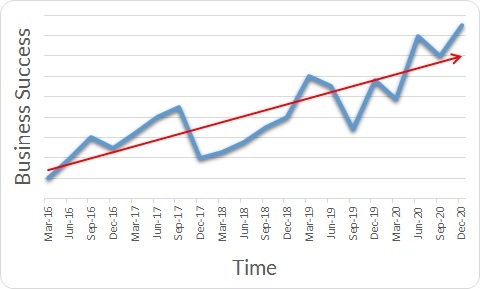 Notice the entire year of 2018 was the middle of a dip in the business that started in September 2017 and didn’t fully recover until January 2019. Even in a wildly successful business, there are always valleys in the growth chart. The ups and downs are a natural, ubiquitous part of the entrepreneurial journey. They’re simply inescapable. And it’s obviously worse in a company that is flat to down, rather than growing quickly. So think about that for a second. All businesses have this pattern. So if you tie your life state too closely to the business then boom! You’re on the roller coaster. The sooner you see the truth in this, the better off you are. Your business is a roller coaster and it always will be. But your entrepreneurial journey doesn’t have to be! Think about the toll 2018 would take on the entrepreneur in the example above if they had fallen into the trap of basing their life state on the business. It would’ve gutted them! And that’s just a dip in the middle of a wildly successful business! If you’re not careful, your business can easily take over everything. It starts by dominating your thoughts. When the pressure ratchets up at work, work starts sneaking home with you in your head. Even when not sitting at your computer, you may find yourself thinking more and more about your work challenges: while you eat, in the shower, and maybe even in your dreams. Next, your business will start stealing time. You’ll work longer and longer hours, cheating yourself of family and rest time. Before you know it, your back will be aching from long hours at your desk, and you’ll realize you haven’t been to the gym in weeks. When you do make it home you’re only half present, and your family knows it. And just like that, your physical, social, emotional, and spiritual health begin to decline. The only solution is to consciously choose not to get on the roller coaster in the first place. That doesn’t mean don’t go on an entrepreneurial journey! Instead, go on it recognizing this pattern, understanding the risks, and with a commitment not to tie your life to the state of your business. When your business goes through an inevitable dip, it actually presents an opportunity for two separate wins. The first win is obvious: get your business out of the dip. The second is less obvious but just as important: maintain your boundaries and priorities outside of work as you get your business out of the dip. Businesses are hungry monsters. They’ll consume you if you let them. The good news is that they can’t force you when you say no! Have you ever heard of the Profit First system? It’s a budgeting system in which you pay yourself out of revenue before spending any money on expenses, then you spend what’s left on expenses to grow your business. This way it guarantees your business is profitable and “lives within its means”. In contrast, most people spend all the money on expenses and fail to pay themselves for long periods. In fact, most of them invest money into the company and spend that on expenses, too. What I’m advocating is you adopt a similar system: Life First. Think through your life priorities by asking yourself this question: “Is my business more important than my _______?” Fill in the blank with words like spouse, kids, friends, health, vacations, spiritual practice, etc. I’m willing to bet that in almost every one of those cases you would put your business second. But it’s easy to get swallowed up in work and not follow through. The Life First system is about drawing boundaries and sticking to your priorities. Set up your outside-of-work calendar before you set up your work calendar. As you set up your calendar, make sure you schedule a balance of activities. Include physical activities like working out, social activities like family time, some recreational activities, adventures, or TV/reading time for your emotional health, and time for whatever religious or spiritual practice you follow. Then, and only then, fill the remaining time with work. From that point forward, your sole job is to defend your Life First commitments. With your life. Because they are your life! A prospective client in a different time zone might only be able to meet when you have a Life First commitment. A key employee might be out sick and need you to step in. And of course, technical emergencies can and do happen at any time. I know what you’re thinking. Dave, this is impossible. My entrepreneurial journey necessitates more flexibility than that. I can’t simply ignore what’s going on and stick to my original schedule. My business will go out of business! Fair point. It may not be so easy. There may very well be times when you have to deal with something unexpected coming up and deviate from your Life First calendar. In these cases, do what you need to do. But here’s the difference in Life First thinking: if you absolutely have to push a Life First event in favor of work, you must reschedule it. When you reschedule, you keep the balance between your life outside of work and your life at work. If you fail to reschedule, then you’ve allowed work to begin cannibalizing your life. The first time it may seem like a small thing, but the small things add up. Before you know it, weeks have gone by since you’ve been to the gym and you can barely button your pants. Little things are significant. Only flex your Life First events when you absolutely have to. By compartmentalizing work and using the Life First methodology, you can achieve true work-life balance. 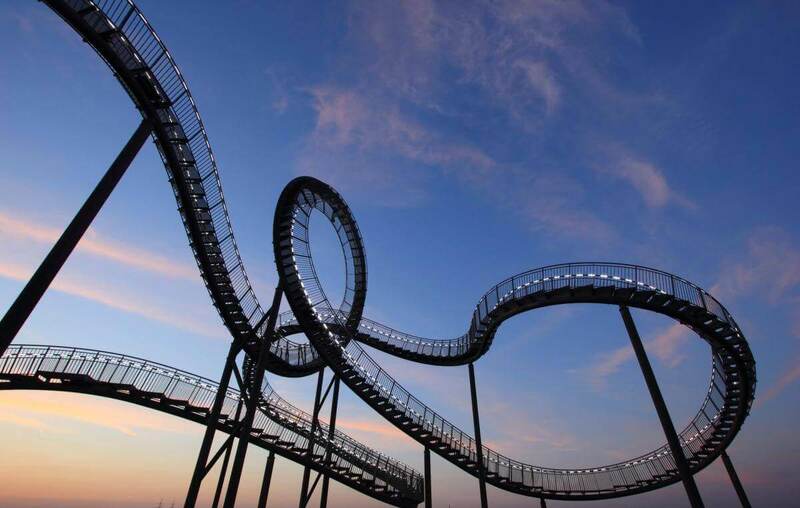 Your business results will inevitably ride a roller coaster up and down. But by protecting the things that matter most, you will end up happier, healthier, and more emotionally stable. You’ll be surprised how much more resilient you become to business fluctuations when your non-work life is in good order. In fact, you’ll be optimally positioned to achieve business success! All you have to do is put your Life First and refuse to go on the roller coaster.